We’d love your help. 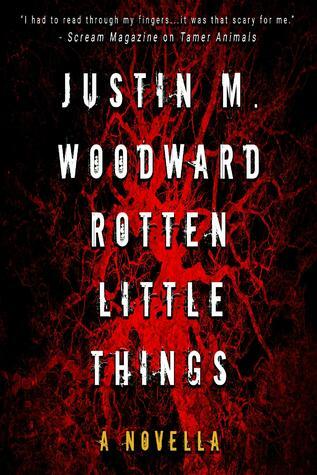 Let us know what’s wrong with this preview of Rotten Little Things by Justin M. Woodward. Monica has suffered from paranoid schizophrenia her entire life. For the most part, she manages her disease well—that is, until her family moves into an old house in the woods, and she starts seeing an imaginary entity from her childhood creeping around the property. Things quickly become terrifying for Monica as her reality begins to blend with fiction, and something else entirely. . . some indescribable evil out in those woods. To ask other readers questions about Rotten Little Things, please sign up. I was a big fan of Justin Woodward's TAMER ANIMALS that came out last year. (you can read my review of that book HERE) It was a very well written and creepy coming-of-age story that featured a legendary creature named the Goatman. Myself and other readers really wanted to see more about that character. With ROTTEN LITTLE THINGS, we finally have more of a look at the elusive and deadly Goatman. ROTTEN LITTLE THINGS is a prequel novella taking place 12 years before the events from TAMER ANIMALS. Yo I was a big fan of Justin Woodward's TAMER ANIMALS that came out last year. (you can read my review of that book HERE) It was a very well written and creepy coming-of-age story that featured a legendary creature named the Goatman. Myself and other readers really wanted to see more about that character. With ROTTEN LITTLE THINGS, we finally have more of a look at the elusive and deadly Goatman. ROTTEN LITTLE THINGS is a prequel novella taking place 12 years before the events from TAMER ANIMALS. You can read the new novella on its own without having to have read TAMER ANIMALS, but you will miss out on those "holy crap" moments that come to light in the new novella. The story introduces us to the Dresden family who have moved to a new home in a small town in Georgia. Monica, the wife/mother suffers from paranoid schizophrenia which she has dealt with for most of her life. They are hoping for a new start, but Monica starts seeing a creature that has haunted her since her youth, appearing in and around the new home. As her episodes get more violent and disturbing, how will she tell real from delusion? And are her visions a warning to what is coming for her next? The author has managed to pack a lot into this fairly short novella. The tension builds from the first pages and we are pulled along as we watch poor Monica's sanity unravel. We are witness to a whole family in decline. Monica's husband and son are there as a support structure, but are helpless to stop what transpires. Justin's writing style is super-tight and you will never feel a lag in the story. It just barrels on to it's very horrifying conclusion. Those who have read TAMER ANIMALS will notice references to places and people they are familiar with. Weather it be a creepy old covered bridge, a ragged house deep in the woods or one single name uttered on the last page. When I got my hands on a copy of Tamer Animals last year, I devoured it. So when Justin announced that Rotten Little Things was being released AND was a prequel to Tamer Animals, I just knew I'd love it. I was pumped when I was chosen as one of the beta readers for it. Rotten Little Things takes place twelve years before the Tamer Animals story. We meet Monica, Jacob and their son Zach. They have recently moved to rural southwest Georgia. We soon learn Monica suffers from paranoid schizophrenia. When I got my hands on a copy of Tamer Animals last year, I devoured it. So when Justin announced that Rotten Little Things was being released AND was a prequel to Tamer Animals, I just knew I'd love it. I was pumped when I was chosen as one of the beta readers for it. Rotten Little Things takes place twelve years before the Tamer Animals story. We meet Monica, Jacob and their son Zach. They have recently moved to rural southwest Georgia. We soon learn Monica suffers from paranoid schizophrenia. While Jacob is a loving, understanding partner, we see Monica is really struggling with her disorder after they move into their new home. Are the horrible things she hears and sees really there? Or are they all in her mind? This is a short novella but it sure does pack a nasty, gory punch. While it could be read without having read Tamer Animals and The Variant, I feel it's best to have read those beforehand. I also recommend you read it in one sitting. Although I probably don't have to tell you that. Once you start Rotten Little Things, there's no way you'll be able to put it down until you finish this horrifying, gruesome tale. I was honored to have been a beta reader for Rotten Little Things. I read the whole thing in one sitting; I could not put it down! What is real? What is not? The uncertainty and terror perfectly sets the stage for Tamer Animals. Whoever said that this story takes you to some frightfully dark places, hit the nail right on the head! I was a beta reader for this nasty little tale and with it Justin M. Woodward packs a punch! At times it will have you squirming in your seat as well as looking around corners before entering a room. Truly unnerving. Fans of the author will love the universe he's building and find the tie-ins to his novels The Variant and Tamer Animals delightful. 5/5 Highly recommend. In 2018 I stumbled upon a few stellar authors through association. I’d connected with J.Z. Foster, who at that time took me under his wing and was really helping me up my presentation and product. It was a blessing. J.Z. had asked if I’d read anything from Justin M. Woodward and I sheepishly said I didn’t know who that was. So J.Z. recommended his book ‘The Variant’ which I snagged and gobbled it up. It was a neat blend of urban fantasy, cosmic horror and real life fears. I then read ‘Candy’ and while it wasn’t my normal cup of tea, the plot line of some bumbling high schoolers who suddenly become embroiled in an action-adventure story was fun. Our relationship has grown over this time and Justin’s one of the nicest guys out there. Some will recall that I offered up my pre-sale profits from the release of ‘The Girl Who Hid in the Trees’ to help offset some costs of his mom’s recent Cancer diagnosis. That Go Fund Me is still going on and if you’re able to donate, that would be fantastic. Then along came ‘Rotten Little Things.’ Justin announced this release about a month ago with the cover reveal, designed by the awesome Brian Scutt. Yesterday, Justin emailed me an exclusive first copy, which (as everyone should do) I read in one sitting immediately. ‘Rotten Little Things’ is a basic tale on the surface. Occurring a dozen years before ‘Tamer Animals’ we’re introduced to a family in transition. Jacob, his wife Monica and their son Zach have moved to a small town, for the opportunity of a new job. Jacob has found a house that works for them, with one key aspect. The ability to build a fence and add some animals. Chickens and goats for Monica to raise and tend while Jacob goes to work and Zach’s off to school. We quickly learn that Monica has suffered from paranoid schizophrenia her entire life. This diagnosis proves to be the main reason they’ve moved to the new town. Woodward does a great job with creating depth in this character, but also creating a very empathetic husband in Jacob. It works really well that he stands by his wife and that he refuses to call her ‘crazy’ or ‘insane.’ It gives the reader a rock to depend on, just as much as the characters depend on each other. One of the best things within this tale though, is Justin’s ability to make the reader question whether we can trust Monica’s point of view. We get some creepy “someone’s in the house,” moments as well as a stellar forest scene that will have you on the edge of your seat. But the biggest star in this book that exudes the most amount of cringe-creep-horror is the thing that haunts Monica’s mind – The Tall Man. The main invader of her schizophrenia is a demented being who frequently stands in a corner of each room and threatens Monica with carnage and violence. Justin wrote some of the best scenes of his literary career within this tale, and The Tall Man features in those scenes prominently. Throughout ‘Rotten Little Things,’ Woodward ensures that Jacob and Zach keep the reader grounded in the here and now, in reality, but his vivid descriptions whenever we’re focused on Monica will have you guessing time and time again as to whether her actions are actually occurring or if it’s something only she’s seeing. The ending was a great twist, and while I don’t want to say it’s done in a similar way like how the ending of ‘Tamer Animals’ was a twist, there are some parallels in the sense you will not see it coming and when it arrives you’ll be pulling your hair out and possibly your eyeballs. It’s a phenomenal conclusion to a superb novella. ‘Rotten Little Things’ is the rare beast that can be read entirely on its own, with no prior knowledge of ‘Tamer Animals’ but also as a stunning companion piece for fervent fans of that release. It builds on the mythology, sneakily answers a few questions that you may still have lingering from ‘Tamer,’ but Justin makes sure to leave a lot of doors open in the best ways possible. I hope we get to see more in this world. Justin alludes to it in the afterword, which is one of the better afterword’s I’ve read in some time, and I hope he continues down this path. Thanks to the author for an advanced reading copy of Rotten Little Things in exchange for an honest review. Receiving this eARC did not influence my thoughts or opinions on the novella. This is my first foray into the mind of Justin M. Woodward and it certainly won’t be my last. I’d heard/still hear great things about his novella, Tamer Animals, on Instagram and gave him a follow. Shortly thereafter, he was looking for bloggers to take on his newest novella, Rotten Little Things, which I later found out to be a prequel to Tamer Animals. I’ve been told that it would be a bigger gut punch to have read TA before, but RLT will stick with me for days now that I’ve pushed through. Tamer Animals may have to wait its turn, at least until I’ve finished sleeping with the lights on. Rotten Little Things is the perfect mix of Adam Nevill and Kealan Patrick Burke. Put The Ritual and Blanky in the same room and just let it happen. RTL is a very quick read at around 91 pages (wait, that was seriously 91 pages?) and Woodward does a fantastic job of never letting up in that short span. It is scary as f^$k and now EVERY SOUND IN MY HOME WILL HAUNT MY DREAMS. DON’T YOU BOUNCE THAT BALL IN THE HOUSE. Back to it. Monica… bless her heart. She has no friggin chance and there is not a thing anyone around her can do. Her husband, Jacob, tries his best to “fix” her, but there just isn’t anything in this life that will stop what is coming. Awesome story. A great prequel to Tamer animals. I didn't see the twist coming which makes it awesome. Justin has proven to be a terrific writer. I love having his books on my shelves along with Stephen King and Joe Hill. Cant wait to see what is next. I'm honored to have received an eARC of Rotten Little Things. This is a prequel to Tamer Animals with the recommendation of reading it after Tamer Animals. Both books will easily be in my top favorite books for 2019. I was excited to go back to the vicinity of the Coheelee Creek Covered Bridge, back to the area where it all began. Twelve years before the events of Tamer Animals, the Dresdens move to southwest Georgia. Jacob has found a new job that will allow his wife, Monica, to stay home and work on her writing. Jacob and their son, Zach, set out to build some shelters for their new little farm, thinking a few animals will help keep Monica company. Monica has battled paranoid schizophrenia all her life and has been haunted by a supposedly imaginary being. The move has been rough on her, and her imagination has been working overtime. Soon it becomes hard for her to distinguish reality from imaginary. This novella is a quick read. Justin Woodward can sure pack a lot of horror into a small space. We are building a cabin in the woods a few miles from our home. We can access it through the woods on what isn't much more than a four wheeler path. I finished reading Rotten Little Things at the cabin, and the ride home in the dark on an unenclosed side by side, wide open to what lurks in the night was not any fun! I make that same ride home in the dark almost every night, but the night I finished this story was different. The next evening, I was at the cabin alone. It got dark before I got my supplies unloaded, so I had to wait until my husband got there before I was able to finish unloading my things. I didn't tell him that was the reason. Thanks for the thrills and paranoia, Justin! Monica Dresden is a paranoid schizophrenic who has managed her mental illness fairly well until her and her family move into a new home. Out in the woods, Monica once again begins hearing and seeing the entity which plagued her as a child. Reality begins to warp, blending with terrifying hallucinations that seem much too real to be just in her head. The new home was supposed to be a good thing for their family, but there is something about the house and the woods that is turning the Dresdens liv Monica Dresden is a paranoid schizophrenic who has managed her mental illness fairly well until her and her family move into a new home. Out in the woods, Monica once again begins hearing and seeing the entity which plagued her as a child. Reality begins to warp, blending with terrifying hallucinations that seem much too real to be just in her head. The new home was supposed to be a good thing for their family, but there is something about the house and the woods that is turning the Dresdens lives inside out. Justin Woodward has done it again! Talk about a wild ride! This novella is short but packs a huge punch. From the very beginning, the mood is set and you are pushed to the edge of your seat. Justin Woodward has so much talent! His writing is crazy descriptive and REAL. As someone who occasionally sees and hears things...let's just say that the way this plot went has left me slightly paranoid! This story had so much happen in such a short setting, but it's done so well and was like watching a movie from start to finish. Monica's character is relatable, but an unstable narrator, which given the plot, is perfect. Is what she is experiencing due to her mental illness or something more sinister? So damn good!! This ending...holy sh**!! Yes!!! I love it!! Honestly, the only issues I had with this story were some grammatical errors (which is expected in an arc, and didn't deter from the story) and the fact I want more! Justin has cemented himself as a favorite author, and I'm looking forward to more stories! I'm a big fan of creepy horror films, movie that don't rely on jump scares. The kind of film where things move slightly in the background or you're never sure if what the characters are witnessing is real. Movies like What Lies Beneath, The Sixth Sense, Stir Of Echoes, and the 1944 original of The Uninvited. The slow, yet intense build to the climactic reveal that ties the story together. The kind of ending where you immediately want to go back and rewatch the whole movies to get the clues you m I'm a big fan of creepy horror films, movie that don't rely on jump scares. The kind of film where things move slightly in the background or you're never sure if what the characters are witnessing is real. Movies like What Lies Beneath, The Sixth Sense, Stir Of Echoes, and the 1944 original of The Uninvited. The slow, yet intense build to the climactic reveal that ties the story together. The kind of ending where you immediately want to go back and rewatch the whole movies to get the clues you missed. For me, this is Justin's best. My only criticism is that it should have been longer. I'm still glad I bought this one, though. Always good to support the new guys and watch them grow as writers. And Justin certainly is growing. Keen to see what's next. I started and finished Rotten Little Things this morning. That’s what happens when I read a book written by Justin. He has a way of hauling you in very quickly, then taking you on a terrifying ride. He has easily become one of my favourite authors. RLT is the prequel to Tamers Animals (if you haven’t read it yet, do yourself a favour and check it out). Monica’s character and the mental illness she suffered was so well written, it had me guessing throughout if what she was experiencing was real o I started and finished Rotten Little Things this morning. That’s what happens when I read a book written by Justin. He has a way of hauling you in very quickly, then taking you on a terrifying ride. He has easily become one of my favourite authors. This is the second story I’ve read from Justin M. Woodward and boy it’s a good one! This is a prequel to his Tamer Animals and here he leads us down the path, through the woods to an introduction with the Goatman. Monica has a history of seeing “The Tall Man” as she calls him. She has suffered from feelings of self-loathing and insecurity most of her life. As soon as she and her family move into a new home, the Tall Man comes for a visit. Her mental condition becomes all she can think about! Join This is the second story I’ve read from Justin M. Woodward and boy it’s a good one! This is a prequel to his Tamer Animals and here he leads us down the path, through the woods to an introduction with the Goatman. I had the pleasure of reading an advanced copy of this novella, and couldn't wait to delve into the TAMER ANIMALS/VARIANT universe again. I was not disappointed! The events of Rotten Little Things take place prior to Tamer Animals, and although it's primarily a story with different characters, it weaves into the previous world that Justin has created. Monica and Jacob move out to the country with their son Zach, and it doesn't take long before we see that something is not quite right. The build I had the pleasure of reading an advanced copy of this novella, and couldn't wait to delve into the TAMER ANIMALS/VARIANT universe again. I was not disappointed! The events of Rotten Little Things take place prior to Tamer Animals, and although it's primarily a story with different characters, it weaves into the previous world that Justin has created. Monica and Jacob move out to the country with their son Zach, and it doesn't take long before we see that something is not quite right. The building terror that Monica faces keeps us wondering what is real, and what is the product of her schizophrenic mind. I work in the Psychiatric field, and can say that Mr. Woodward accurately portrays the doubt, turmoil, and paranoia that Monica experiences as she questions if her fears are grounded in reality, or just a product of her hallucinations. Have you read Justin Woodward’s “Tamer Animals”? Why not??? It’s an outstanding novel. His follow up “Rotten little things” only elevated the mythos he began there, it’s a short, tightly written, book of horrors. I won’t spoil anything, but I will say this, it is incredible, I loved every page of it, and am anxiously awaiting more in this world he created. Go. Now. Get it! Read it!! I have to say that the more I read of Woodward, the more I enjoy his work. This book flowed (for me) the best of any so far. It was engaging, fast paced and pretty much perfect. A dark and wonderfully gripping story. I could not put it down! A perfect prequel to Tamer Animals that had me in tears by the end. Highly Recommend! This story was absolutely terrifying and nightmare inducing! While this may be a prequel to Tamer Animals, as far as I am concerned it stands on its own. I know I probably say this with each new release but this may be my favorite of Justin’s works and his best to date. Poor Monica is so well written that you will find yourself so very afraid for her because there is truly nothing scarier than questioning your own sanity and your own reality! I like to think I know Justin’s writing style and habi This story was absolutely terrifying and nightmare inducing! Bought this with Tamer Animals and read it first. Unfortunately it doesn't make me want to read Tamer Animals. It doesn't help that the author's comments at the end contained an important spoiler. Slogging through descriptions of Monica's delusions was exhausting and felt more like fillers in the story. Sorry, but not a satisfying experience. Living with a disability can be hard enough, unless your Monica then your living in hell! Moving to a new city is tough and hectic, but when you add the voices and imaginary images you begin to question everything, and that is exactly what Monica started to do. This prequel to Tamer Animales is utterly amazing! A page turner you'll refuse to put down! On sale for $0.99 now!